The first question ought to be: what does it mean now to speak of the absent and the invisible in cinema? Specifically in cinema, which is the art of the visible, par excellence. What happens to the pleasure that film images give us if we can no longer see them? What happens to the physical and sensual side, that seduces us immediately, through our gaze? One would have to speak here of the cinema that is not seen, the images that we are not given to see – but which, nonetheless, we still see. That nonetheless is a sign of impatience, of stubbornness, of insistence or persistence on our part. We can say, thus, that we see these images because we want to see them – and, in this sense, they may be different for each one of us. An antecedent for what I wish to describe can be found in Marc Vernet’s 1988 book Figures de l’absence (Figures of Absence).1 The look into the camera, the subjective camera, superimposition, the portrait, the absent character: these are categories suggesting something … something resembling a presence. But do they also suggest an event, a thought, a narrative fragment, or a fragment of time? Perhaps what matters is less the object chosen than our ways of talking about it, our attempts at indicating such objects; and, through those, to talk about many other things. Let us consider the act of ‘looking into the camera’, in the scene from Jerry Lewis’ The Nutty Professor (1963) in which Professor Julius Kelp has already changed into Buddy Love, but the viewer does not yet know it. Moreover, the spectator assumes that he has turned into a monster, in a variation on the ‘Mr Hyde’ figure. After the transformation, we are not allowed to see the end result; we pass instead to a subjective shot from Professor Kelp – at least, we assume it is Kelp. As the camera adopts this point of view, it moves about the street. People look into it, they are looking at Kelp, but they are also looking at us. We are Kelp. Each person present (men, women, even a traffic cop) reveals themselves to be horrified (we believe) by what they are seeing, and everything goes quiet. Finally, as the shot continues, Lewis/the camera enters a club where a jazz band plays and people are dancing. The film cuts to a closer shot of the pianist and of those nearby, who seem equally fascinated by the camera, by Kelp. And then comes the sudden but hesitant reverse shot: we see the creature that Kelp has created with his experiments, Buddy Love – a handsome, attractive guy, whom the camera approaches as if filming him secretly, using zooms and creating a grainy, blurry image. Now we know: people have been startled by an outbreak of beauty – not of monstrosity. What is the absent here, what is it that suggests another world on the basis of this scene? The absent images of the scene are the reverse-shots belonging to those characters looking into the camera. To execute it as a continuous movement, Lewis suppresses these shots – and thereby cancels any possibility of interpretation. Otherwise, we would have seen from the start that people are surprised by Buddy Love’s beauty. That period of staying with the camera, however, eliminates any reality effect – and plunges everything into a hallucinatory fog, typical of a nightmare-state. Pedestrian activity is suspended in this event, so we miss the typical turmoil of a city street. Everything is silent – except for Buddy Love’s footsteps. By negating the presence of the reverse shot, and turning it into an absence, Lewis creates a suspended space-time, a representation of the phantom just as Freud conceived it.2 The phantom is what reality becomes, or what appears within reality, when we look at it in a certain way, like in a daydream. The passers-by in The Nutty Professor are caught in that daydream, the daydream of metropolitan fantasy, of what is beautiful and what is monstrous in a new, urban society, and are as dazzled by what is beautiful as by what is monstrous. Therefore, what is beautiful is also monstrous – provoking exactly the same reaction. That is why we do not see the face of Buddy Love as they look at him – for us, he is an absent image in this new space-time axis in which he does not participate, because he has created it. His gaze has created this world, or better still, has granted it its true status. And his face can be anything, beautiful or monstrous, because, in any event, it breaks both the social order and the cinematographic order. The absent image cannot be described, no matter whether the film seems to allow that. When Lewis feels compelled to do so, he creates in turn a new, representable figure, but approaches it fearfully, with a ragged zoom and a blurry image, as if filming it from another absent place that is not in the camera’s axis. So let us say that what is absent from the look-into-camera and this subjective shot is not the reverse shot from those who look, but a presence that cannot be simply shown, because it is unrepresentable. This concept is important. How are we going to convert the unrepresentable into an image? Or how to explain it within an analysis made up of images – in what we are calling a video essay? We shall return to this. There are two films that seem to me essential, in order to begin seeing this. Two camera movements that indicate a passage to the dream-state, but also to many other things. In The Woman in the Window, directed by Fritz Lang in 1944, Edward G. Robinson settles into his chair at the clubhouse to read a little, and asks the waiter who serves him a drink to wake him at half-past ten. Immediately before this, he has seen the portrait of a beautiful woman in a shop window, locked inside three consecutive frames: that of the camera, the glass of the showroom window, and the painting’s frame. This ideal woman is found in the depths of cinema, of the unconscious, and of representation. In any case, in the scene, a lap-dissolve takes us to an image of a clock and, then, to another image of Robinson still reading; he is advised of the late hour by the same waiter. It is now half-past ten. Or is it really? The end of the film reveals to us that what happens from this point is the dream of the protagonist: the seduction and deception he undergoes at the hands of the Joan Bennett character – so the image of the clock and the waiter waking Robinson are already part of that dream. But where and when does the step out of reality occur? This is the absent image, the invisible narrative of what happens. And it hides in the lap-dissolve, which compresses many things. I am not interested in the visible image, which a fade always renders abstract, but rather the image that is not there and which, nonetheless, the fade compresses. In that lapse of time (when Robinson has gone to sleep, as we later come to know), there is both a physical fact and a mental fact: a man falls asleep and stays asleep for some time; that same man dreams, and the dream that he dreams is the film. But what does this sleeping man do? Is he doing what Andy Warhol shows us in Sleep (1963)? And does the dream correspond to the film’s images? In the absent image or images, the mechanisms by which a dream is transformed into cinematic images are conveyed: they are the raw images of the dream, and as such it is impossible that they could be any more material, sensual or physical. The goal of classical cinema is, on the one hand, to cover up this raw material, and its potential capacity for subversion; and, on the other hand, to suggest this content for the spectator’s disquiet. If, in the eyes of The Nutty Professor’s ‘spectators’, what was disconcerting was the beauty-monstrosity of what we do not see, then, for (we) spectators of The Woman in the Window, there is the desire to know what is hidden during that fragment of time we are given to see in a fade. An intriguing variant of this same procedure occurs in Otto Preminger’s Laura (1944), when detective McPherson (played by Dana Andrews) also falls asleep, but not, this time, thinking of a painting – rather, he is situated near a painting. 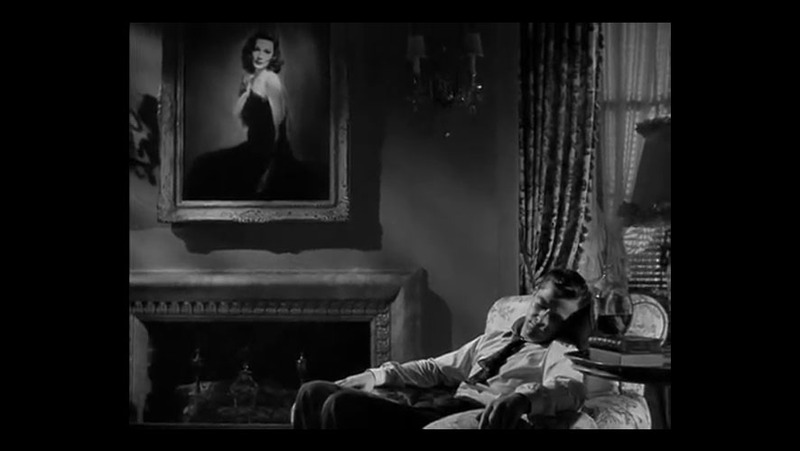 The painting is another image of a woman, Laura Hunt (played by Gene Tierney), who has apparently been murdered, and who obsesses the detective. After moving into her house, allegedly to continue his investigation, McPherson falls asleep in an armchair (just like Robinson in The Woman in the Window) and the camera moves towards him. After a few moments, the camera moves back again, without cutting. Then the door opens and Laura appears: she was not murdered, she had only spent a few days in the country, without telling anybody else. There are two possibilities: the realist possibility, in which McPherson has gone to sleep and is then awakened by the noise of Laura entering the house; and the oneiric possibility, in which McPherson, like Robinson in The Woman in the Window, does not wake up – it is only in a dream that Laura enters, and lives, thus suggesting that the rest of the film is a dream that is neither closed nor confirmed by a return to the waking state. If we take into account the fact that Lang wanted to end The Woman in the Window without any reference to the oneiric condition of the relationship between Robinson and Bennett, would it then be so outrageous to adopt this second dream-option for Laura, too? In both films, there may have been a dream. But what is the absent image here? It is compressed into a tracking shot, the camera movement that approaches and then withdraws from McPherson’s face and that, in any event, gathers time into itself. As part of this trajectory, things happen, there is a narrative: Laura arrives home from the country, as if McPherson has invoked her – as if his dream could invoke images that have hitherto been absent from the film. It is indeed seductive to imagine this narrative alongside the narrative that is provided on screen. Laura arrives, McPherson dreams of her – as if both are drawn by the same magnet. There is a hidden love story that the spectator can reconstruct via the information provided: isn’t this one of the mechanisms of narrative itself? Isn’t there an invisible narrative inside Laura? We have been talking about classical cinema and modern cinema. The step from one to the other is the visualisation of an image, or various images: the thought-image that is transformed into an image actually seen on screen. And therefore, we must also think about this step, this transition. I would like to reflect on this using the film Bonjour Tristesse, directed by Otto Preminger in 1958, which continues to fascinate me. The beginning and ending of this film are like that transition, a suspension containing the rest of the story, which in turn occupies most of the running time. A suspension between two looks that does not lead us into a dream-state, but to another level of the real that is the ‘putting into images’ of a thought and a memory. Jean Seberg looks, simply looks. In the prologue, she looks at us. In the epilogue, she looks towards an off-screen space that is never shown. 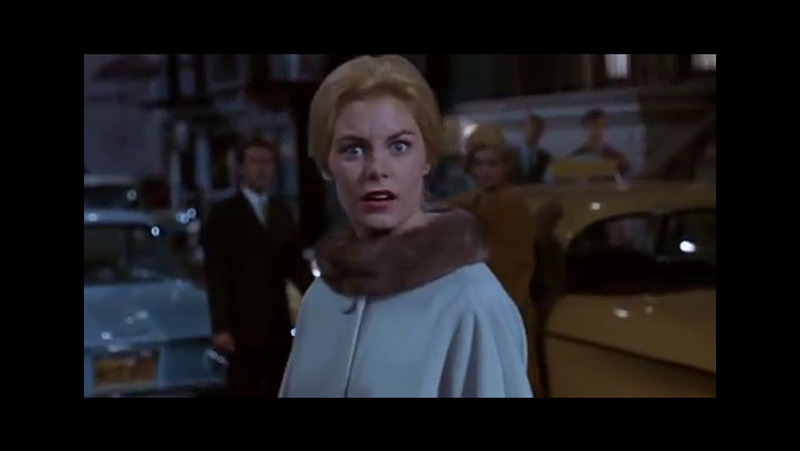 In both cases, her gaze is always directed beyond the frame – contrary to the case in The Woman in the Window and Laura, where the look is folded into the frame, or in The Nutty Professor where the look was simply not there, or was directed at the spectator, so that later the spectator could give back this look in the shot, transformed. In Bonjour Tristesse, we are talking about a lost or oblivious look, which is the look of modernity. And which image shelters this look? The image of the narrative in its entirety, or at least a doubt concerning this narrative: is what we see in the central section of Bonjour Tristesse what really happened, or is it the vision belonging to Seberg’s character? Recall that, in the prologue and epilogue, she insists that she is “surrounded by a wall of memories”. It is this wall that always returns her gaze. At the start and the end, she looks at the spectator and at the mirror (neither of which we see: or are they embodied, in the prologue, by Juliette Gréco? ), so that her look, in an invisible manner, bounces back and returns to her, again and again. She cannot see beyond herself, or beyond the invisible wall of memories that surrounds her. Inside this circuit, she does not dwell in a dream-state, but rather a consciousness of reality, which is a wounded consciousness, the consciousness of modernity which no longer distinguishes dream from reality – such that the central, colour section of Bonjour Tristesse could be both things, a base reality pierced by memory in the form of a dream. That is what stirs between Seberg’s two gazes, at the start and at the end, so that you do not even need to see the rest of the story to fathom this: that something has happened, something which has scarred her forever, a series of images that have left their tracks in her gaze, diverting it from its natural course in order to hurl it outside. She saw so many things that she can no longer see anything. And, from that point-of-view, the central narrative can be interpreted as the story of a young woman who only has eyes for her father and, when someone enters the field of this look, she can only think of removing that obstruction from her view. The result, in the beginning and ending of the film, is this moment in which the woman who once looked, no longer has anything to look at, because everything has disappeared from her sight – her youth has been transformed into a desolate, black and white image that she can no longer bear. We have indeed seen the absent image, but its status is uncertain – as if the film wished to dress in the guise of truth something that is only a memory, or an interpretation of reality. Modern cinema gives us the absent image to look at, but casts doubt on its own representation. Now recall Michelangelo Antonioni’s L’eclisse released in 1962, between Bonjour Tristesse and The Nutty Professor. In the long final scene, the places where Monica Vitti and Alain Delon previously passed are now empty. This suggests, therefore, an absence. But this absence is not an absent image, since we have already seen the images of both characters walking and talking in these spaces. Why this repetition? It is like allowing us to see a space to which we have not previously paid attention. The absent image is this place, these empty spaces – not the characters’ bodies.3 Earlier, we fixed on the characters because they possess bodies – but bodies are not the essence of cinema, or rather, they are not the only important thing in cinema. The essence of cinema is the void – and the materiality of that void. How to film it? Twice, using repetition. That is how it can be fixed to the spectator’s gaze. 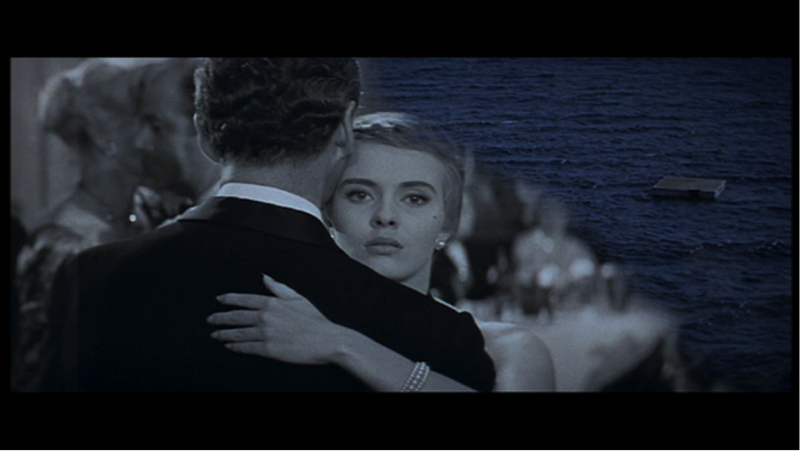 Seberg’s direct address was also shown twice in Bonjour Tristesse. The first time, it was full of promise: promise of a story to be told, and because of this she was looking at the spectator, as if to say: “This is where my story – and the film – begins”. By the second time, we already know everything that has been told and shown – but I do not know whether this everything amounts to what we should have seen, since there persists a feeling of the void, which is the true absence of the true image. From plentitude to void, as happens in L’eclisse: in its plentitude, the void is already inscribed. In The Nutty Professor, those people, that crowd looking at us, give way to an image of the void of what we were seeing, which was ourselves, the camera, someone’s double or someone else who does not exist, who ceases to exist as the film unfolds: this is another circular gesture of modernity, which moves from the intuition of absence to its representation in a void – the voided body of Buddy Love, the hollow gaze of Jean Seberg. In four of the films I have commented on, we can trace an itinerary that passes from one extreme to the other, over and over: the image that beats inside the visible image, within a fade, which is then converted into a narrative (The Woman in the Window); the image that is seen under a camera movement and arises to fill the gaps in the narrative with an ‘imaginary’ sub-narrative – ‘imaginary’ being a word that comes from ‘image’ (Laura); the absent image is promised, but not delivered (Bonjour Tristesse); and the completely absent image which is then visualised (The Nutty Professor). The attempt to make an absent image visible is characteristic of modern cinema, so in this sense Bonjour Tristesse and The Nutty Professor represent the inauguration of this feeling, coming respectively from the narrative and from the shot: to narrate the origin of Seberg’s empty gaze (at the start), now only gives way to another empty gaze that cannot even directly solicit the spectator (at the end); while the approach of the camera to Buddy Love’s figure is full of doubt, trembling, as if it is impossible to fully grasp the key to this enigma. To show the absent image places us on the brink of a void. Returning to an earlier question that I left in the air: what relationship does this absent image have to the video essay? How can we make visible what, in reality, does not exist – so that the spectator, in turn, can see it? If these absent images are to be confronted, the video essay must abandon its pretension to comparing, and handing absolute freedom over to the spectator – since what it gives to the spectator are fragments of a void as well as pauses or intervals between these fragments. One might begin to work in this field with the willingness to give back to literature its role in filmic analysis, somewhat asphyxiated by a certain excess of images that, on occasion, was seeking to replace the act of re-creation in words, and the type of thought which slowly grows as we reflect on the filmed object. But one might turn to the video essay in an attempt to make the image arise from the place where it does not exist, from its suspension in the void – in the way, I would say now, that the analyst becomes a kind of sculptor who shapes the figure hidden in the stone, trying to explain the materiality of this void and this absence. A materiality that does not reside in bodies or landscapes, nor even in figuration, but only in the moment of transformation. So that would explain the interval that lies between the image of Delon and Vitti in the landscapes in L’eclisse, and what we see when those landscapes are already empty: the moment in which something is volatilized – a moment that cannot exist on its own, but only in one and another instant of the film, in this intersection. It is not a matter here of interpreting images but, rather, of interpreting transitions, a fleetingness that takes shape only for an instant. The clearest representation of this pause is to be found in a Spanish movie from 1979, Arrebato (Seizure), directed by Iván Zulueta. In it, a guy spends his life filming himself while he sleeps; he discovers, when he projects the images, that right in the middle of them there appears a red frame – a frame that, in successive bouts of filming, is onscreen for longer and longer. What is happening while the camera produces this image? Where is the absence? Finally, he discovers that the camera is snatching away life itself – so the film’s title refers both to the ecstasy of his experiments, and to the sensation that he is being seized from life. Compare this experience with the previous films. Let us try to compose a video essay from all these images of the void, the pause, and the interval: changes of shot in The Woman in the Window up to the point of the leap into the dream-world; the in-and-out tracking shot from Laura and its ambiguous ‘border zone’ status; any of the looks into the camera in The Nutty Professor and their revelation of the other side; a superimposition of landscape shots as inhabited by the two figures of L’eclisse with other shots of the same but empty landscape; the red frame of Arrebato, which in reality could represent any of the other pauses, having no identity, except that which allows it to erase the image and become the very representation of absence, the gap left by the figurative. This is the entry, not into dream, not only into the void, but into non-existence, which shows itself to be as powerful in its representation as existence itself. And what can express better what we do not know, than the colour red – danger signal, but also blood, and excitement? The video essays of absence must find this magma that arises from the other side, but is just as real as everything that dwells on this side because, in the end, everything is an image seeking a way to make itself present. When the video essay grasps the comparison and visual analysis of the absent, then the possibilities that open to it may be infinite. A. The woman looking at the camera, which is actually the face of Buddy Love in The Nutty Professor: What is on the other side? B. 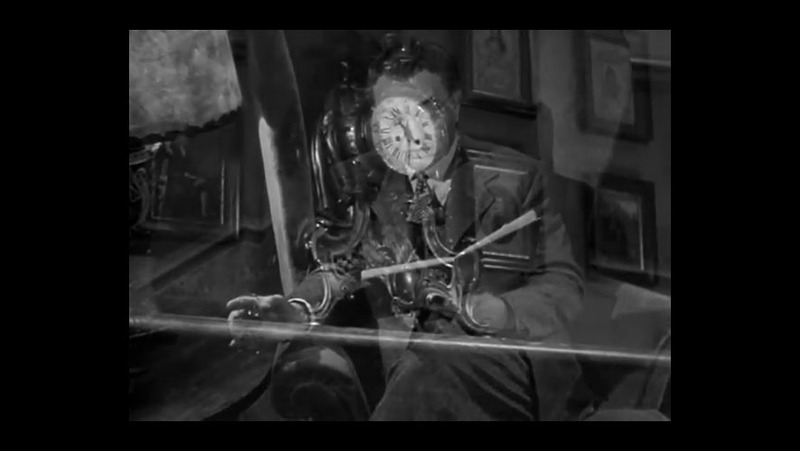 The lap-dissolve between the faces of Edward G. Robinson and the clock in The Woman in the Window: the passage from reality to dream? C. Dana Andrews falls asleep in the armchair in Laura and the camera moves towards him and then back out again: how much time has passed? Are we in another dimension? D. The colour story that opens up in the black and white image in Bonjour Tristesse: is the absent image thus invoked true or false? Carlos Losilla, ‘The Absent Image, The Invisible Narrative’, [Frankfurt Papers] The Audiovisual Essay: Practice and Theory of Videographic Film and Moving Image Studies, September, 2014. Online at: http://reframe.sussex.ac.uk/audiovisualessay/frankfurt-papers/carlos-losilla/. Carlos Losilla is an essayist, lecturer at the Universitat Pompeu Fabra and at the ESCAC, serves on the editorial board of the journals Caimán Cuadernos de Cine and La Furia Umana, is film critic for Time Out Barcelona and a collaborator on the Cultura/s supplement of La Vanguardia newspaper. He has published numerous books, including La invención de Hollywood (2005), Flujos de la melancolía (2012), La invención de la modernidad (2013) y Zona de sombra (2014). He has also contributed to international publications, including Vincente Minnelli: The Art of Entertainement (2010), A Companion to François Truffaut (2012) and Numéro trois: Variations sur Numéro Deux de Jean-Luc Godard (2011). Carlos Losilla es ensayista, profesor de la Universitat Pompeu Fabra y de la ESCAC, y miembro del consejo de redacción de las revistas Caimán Cuadernos de Cine y La Furia Umana, además de crítico cinematográfico de Time Out Barcelona y colaborador del suplemento Cultura/s del periódico La Vanguardia. Ha publicado numerosos libros, entre los cuales pueden mencionarse La invención de Hollywood (2005), Flujos de la melancolía (2012), La invención de la modernidad (2013) y Zona de sombra (2014). También ha intervenido en publicaciones internacionales: Vincente Minnelli: The Art of Entertainement (2010), A Companion to François Truffaut (2012) o Numéro trois: Variations sur Numéro Deux de Jean-Luc Godard (2011).